Pizza base topped with tomato sauce, sliced Frankfurter sausage, Cheddar cheese and medium fat hard cheese. 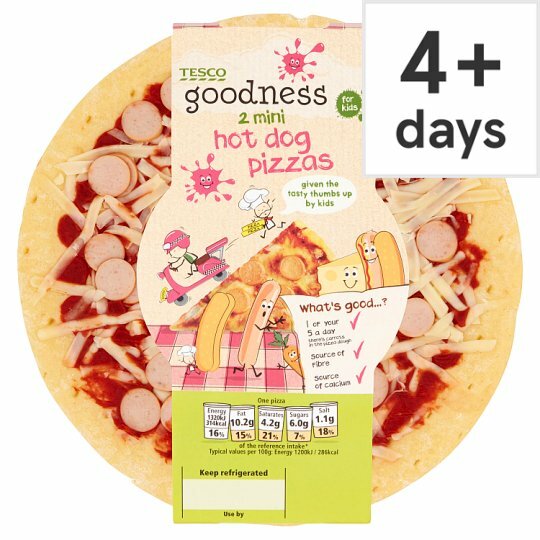 2 Mini Hotdog & Cheese Pizzas Carrot enriched base added fibre, rich sauce and cheese for extra goodness Calcium is needed for normal growth and development of bone in children. This is why we hide goodies in our products, so that your child can love food that's good for them. Wheat Flour (Wheat Flour, Calcium Carbonate, Iron, Niacin, Thiamin), Water, Frankfurter Sausage (11%), Cheddar Cheese (Milk) (10%), Tomato Purée, Carrot, Medium Fat Hard Cheese (Milk) (3%), Yeast, Rapeseed Oil, Wheat Fibre, Sugar, Cornflour, Salt, Soya Flour, Whey Powder (Milk), Flour Treatment Agent (Ascorbic Acid), Parsley, Basil, Oregano, Garlic Powder, Chilli Powder, Onion Powder, Cayenne Pepper. Frankfurter Sausage contains: Pork, Water, Pork Fat, Salt, Potato Fibre, Stabiliser (Dipotassium Diphosphate, Disodium Diphosphate), Dextrose, Antioxidant (Ascorbic Acid, Rosemary Extract), Acidity Regulator (Citric Acid), Garlic, Preservative (Sodium Nitrite), Cayenne Pepper, Pepper Extract, Paprika, Pepper. Instructions: From Chilled: 200 °C / Fan 180 °C/ Gas 6 5 - 7 mins. Place pizza directly onto the top shelf of a pre-heated oven for 5-7 minutes. Instructions: From Frozen: 200 °C / Fan 180 °C / Gas 6 7 - 9 mins. Place pizza directly onto the top shelf of a pre-heated oven for 7-9 minutes. Remove all packaging, including card disc.